However, the most interesting thing about these escapades into Google Books, is the serendipitous nature of the affair. 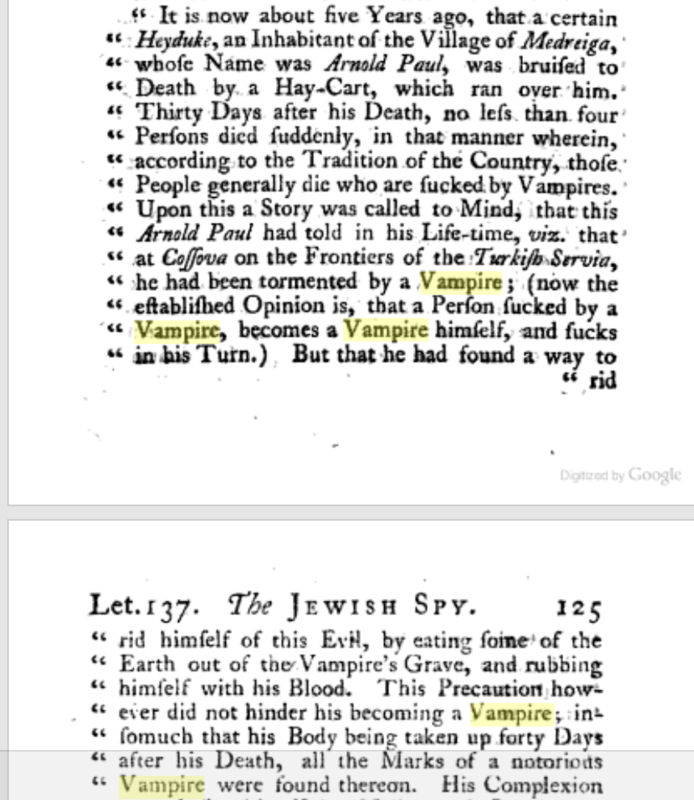 Reading some of those early accounts on vampires, for example, can be enlightening and fun. For instance, you must remember that mid-XVIII century English was written substituting most letters ‘s’ for ‘f’ and, when it comes to a subject like ‘vampires’, such reading can startle many casual readers. I find these “letters” to be amazing accounts of certain aspects of the time in XVIII century Europe. The specific letter goes on for a few more pages and I invite you to take a look at the above links. Supernaturality in its proper place. Well, I suppose it was, perhaps, a little Valentine’s card that was sent with a heavy heart at the loss of a lover that moved away in search of…, who knows what he went searching for. Of all places, I found this card, envelope and all, inside a Doris Lessing’s book. Not precisely the most obvious place to misplace a love card but I’m not judging. I believe the card was too precious to just throw away but it didn’t warrant the estate of mind necessary to store it, say, in a poetry book. Perhaps the card has lived in many places before finding its present place but Lessing’s “The Sirian Experiments” is a fitting place for lost causes. I found the book about a year ago, in one of those used book sales that happens once a year at the Concord Mall in Delaware. When you browse through a couple thousand linear feet of books and tens of tables brimming with them, you tend to stick with what stands out, prominently. I’m not sure what compelled me to flip through the pages of the book to find that card inside but I’m happy I did. Indeed, the card, from the very early 80’s, is a “message in a bottle.” Makes you seriously wonder about the paths Ray and Kathleen took in their affective lives. Did they ever “find” each other again? Did Ray ever found that chimera–in Kathleen’s mind–he believed to be in Oregon? Did Kathleen find the soul mate she so desperately needed and thought to have found in Ray? Ah, so many questions… If I was Nicholas Sparks finding this card, it would prompt me to write my next bestseller. The present work is a translation of Part 2, Section 10, of the book “Tratado I Ching — El Canon de las Mutaciones — “El Séptimo Tiempo”” by Ricardo Andreé, privately published in Santiago, Chile, in 2004 (no ISBN but Mr. Andreé’s books can be purchased at http://www.iching.cl/). This section is named “Tiempos” (Times) and deals with the proper timing of Yijing answers. The Copyright of the original Spanish text is held by Ricardo Andreé, Santiago, Chile., 2004. The Copyright for this English translation, as well as all the included graphics, is held by Luis E. Andrade, NJ USA., 2010. All living things come forth in the sign of the Arousing. The Arousing stands in the East. They come to completion in the sign of the Gentle. The Gentle stands in the Southeast. Completion means that all creatures become pure and perfect. The Clinging is the brightness in which all creatures perceive one another. It is the trigram of the South. That the holy sages turned their faces to the South while they gave ear to the meaning of the universe means that in ruling they turned toward what is light. This they evidently took from this trigram. He battles in the sign of the Creative. “The Creative is the trigram of the Northwest. It means that here the dark and the light arouse each other. Here is the cycle of a year and the completion of a day. In its ascendant circular movement, the time commences in Chen, at the Orient (East). This isn’t a synoptic map, therefore it should not be confused with a cartography exclusively Chinese and applicable only to that region of the world. This is a cosmic order that has no possible alteration, remaining immutable before any climatic changes or geographical coincidences. The incomprehension of this order and the lack of a mystic experience, something necessary to comprehend the “why” and the “for what” of the inalterability of this order, have caused subjective interpretations, such as the change or alteration of the original figure according to geographical hemispheres. We’ll say that Spring is a state of cyclical energetic renovation that occurs at an extra-terrestrial level and is directly related to the evolution of the planet. Summer is established in the astronomical South, the one that is placed above in the Microcosmic order, and correspond with the period when the solar dilatation surround the planet, determining its high and low energetic processes. Autumn is in direct relation with the Spring, as a polarity, and is placed due West, both in the Earlier and Latter Heaven sequences, and is related to the transfer of solar energies to telluric energies. Winter is found in polarity with the sun, due North and below, and acts by oppositional momentum, attracting and concentrating the primordial energies in the heart of the planet; is when the telluric energies are activated and the vitality that comes from below makes its effects felt. In this order, the signs Ken, Sun, Ch’ien, and K’un accomplish fundamental transition roles; without them, the polarities would eliminate all vestiges of life. For this the Mother and the Father act as central spirits just as the action of the sun ceases and the telluric energies predominate. Once more, let’s clarify: the Micro order is observed from the Macro and builds upon the degree of influence of the sun, putting the South at the point where the solar energy is at its climax; the North, where it is declining. Ken and Sun have responsibilities which less drastic but always very balancing. It is in this light that we must understand the circle: if in the designation of the rotation a year we find that it coincides with the cosmic spring and the weather season indicate the same month, this should not lead us to confusion. Obviously it is easier to explain to a South American that summer is in January than to a European that in that month is planning for snow. The same happens to places where the seasons are two and not very different among themselves, or even worse when it applies to a country with different climates in different regions due to its large size. There are several ways to properly address this relationship of time measurement, all very valid especially if practice gives them a grip that does not part from the core of this teaching. We will discuss the most common and perhaps the most flexible and suitable to be used. We have obtained a hexagram with changing lines, therefore a Principal and a Tendential (Derived). The first thing to do is locate the point where we are: that is, whether the query is carried out under the trigram Li, Tui, K’an, Chen or Sun, K’un, Ch ien, or Ken. Once established this referential base, we trace a path that starts in the Lower Trigram and culminates at the location of the Upper Trigram. It may happen that a sign culminate when another begins, this reflects a correct harmony. It is also possible that both signs run parallel, in which case the Principal maintains its status and the Tendential acts as the Ascendent. Sometimes those parallels talk about very different situations in the same person. The worst that could happen is that it give times of very short duration, separated by several Trigrams and also in the past: that is a chaotic picture of a totally unbalanced mental state and a troubled spirit. A beautiful chart is when the Principal starts almost right at the time of the consultation and its Tendential is coordinated perfectly with the Principal, so that the person gets almost everything in the future, a sign of good balance and inner harmony. Once the time has been established we proceed to measure it. The rotation of the circle has a duration of 24 hours, so that from Chen, the dawn, we’ll assign each Trigram 3 hours, being the initial sign the hours of 5 to 7 hours; Sun from 8 to 10 and so on. The same applies to the year: it has, in this static measurement, 360 days and 24 hours, the division of which time gives each sign 45 days, so we will assign 45 days periods to each Trigram to facilitate the calculations. Obviously when dealing with precise calculations are taken into account minutes and seconds and leap years, which lengthens the year to 365 days. This subtlety is not useful for a simple case of orientation. 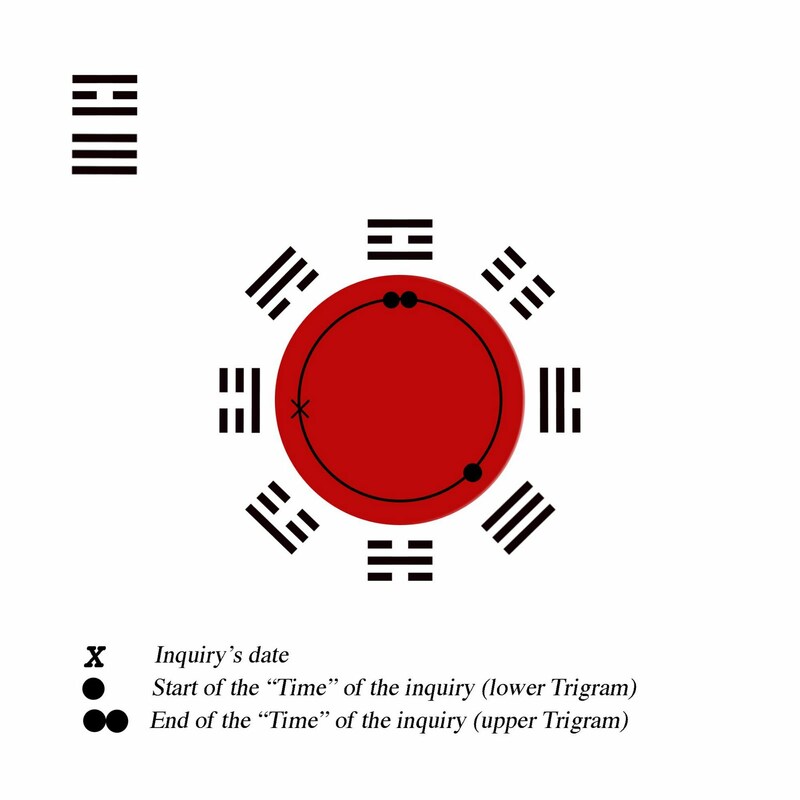 If in the example above, where the Principal Hexagram went from Ch’ien to Li, we will proceed to count the signs, including the sign Ch’ien, that enclose the set time: in this case 6 Trigrams. Multiplying this amount by 45, which are the days of each sign, gives us 270 days. Because each line that makes a Hexagram is a particular time, we’ll divide 270 days by 6 times and obtain what is the length of time for each line, which in this case gives again the original 45 days; this way you can clarify exactly when the movement was or should be. This is one of the basic movements of the Microcosmic Rose. The Macrocosmic Order (t.n. : this refers to the Xian Tian Bagua or Earlier Heaven order. )has different movements. Another movement of the Later Heaven Order works with the polarity of the semi-signs, which has been called “retrograde motion.” The principle states that every manifested element has an root cause; moving back to the root we can then understand the effects up to their most plausible conclusion. The other aspect that should be taken into consideration is that a Hexagram, in fact, does not remain static, and which in practice is moving. The movement never ceases. Change is life. The objective movements of each sign are marked by the role of the Regents; each subjective or particular line signal the movements of the same name. However, the 64 signs spin in circles, this spin is objective, that is, symbols do not move according to our cosmos but on the contrary, our cosmos moves by the great cosmos of the signs. This is why the sages teach the Book of Changes, because these writings contain the formula to harmonize our existence with circular movements of the 10,000 things contained in the 64 figures. It is very important to keep this in mind: it can change the outlook on life and the world of a sensitive and attentive student. 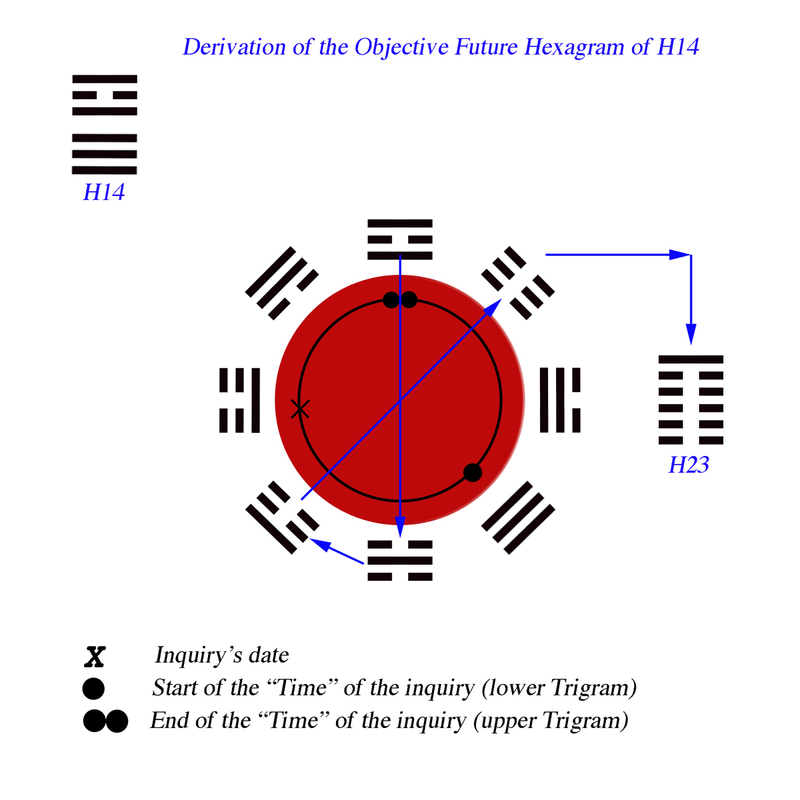 The upper trigram of a Hexagram tend to go away, to leave, is the oldest, is where time is closed. If, following the previous example, taking the Upper Trigram Li, we obtain the oldest source, which comes from below and disappear before our eyes. Said Trigram contains the information of the objective future, the natural tendency of the sign. Locate it in the Post Order (Huo Tian Bagua/Later Heaven Order) and extend a line to its polar complementary Kan, immediately jump to the next sign–that is, Ken–, and join Ken to its polar complementary, K’un. Of these two Trigrams, the oldest is Ken, because it comes from the retrograde motion of Li to Kan, that is, it is the Kan seed of the polar sign that is now manifest. K’un, as a consequence, is the newest trend and stays below as the lower Trigram. 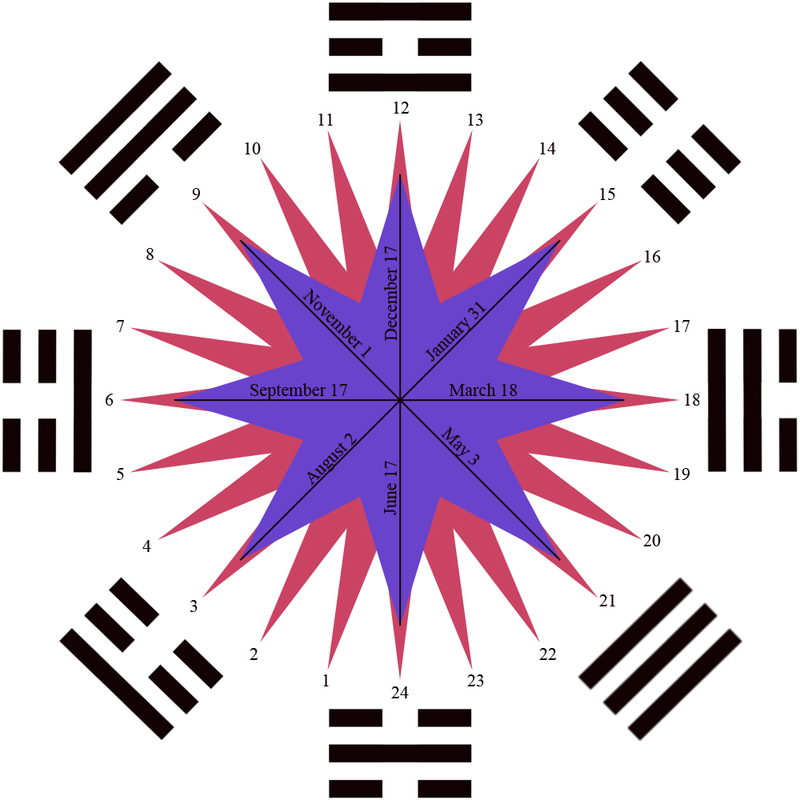 Thus the hexagram K’un-Ken (H23) is the objective future trend in the circle of 64 signs. If the student wants to know the objective past, he/she must perform the same operation but this time with the lower trigram. In this example Ch’ien is still moving within the sign, so it gives it a bigger time coverage. It comes from the immediate past, both semi-signs have their origin in the past because, as stated earlier, the Microcosm turns after the Macrocosm and Man walks behind his Microcosm. 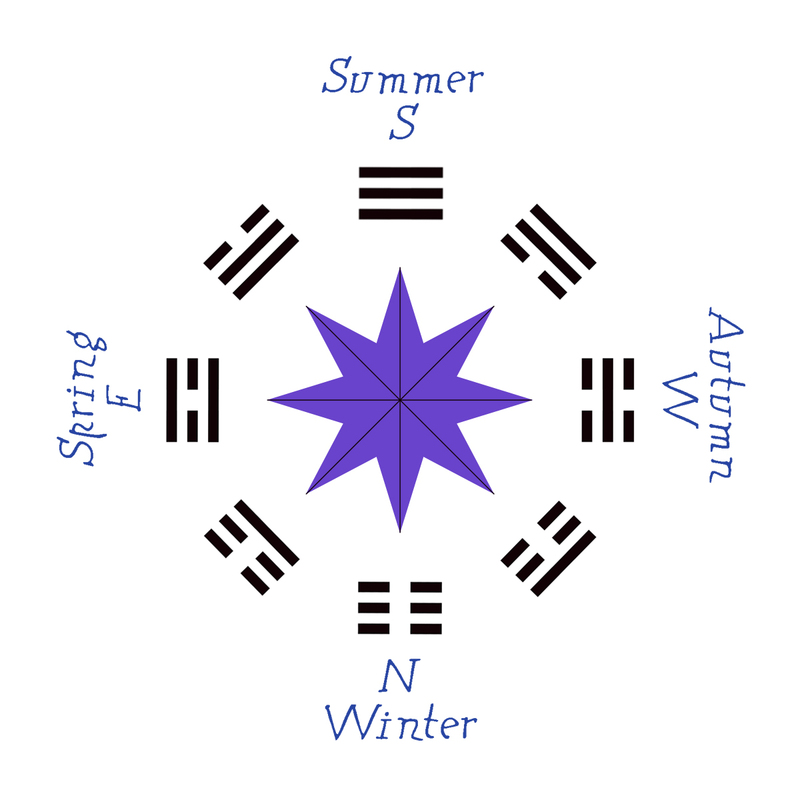 Ch’ien has as polar complementary, in this Order, the semi-sign Sun; we extend a line to Sun and jump back a Trigram, that is, a jump from Ch’ien to Sun to Chen. Join Chen with its polar, Tui, and separate them as a Hexagram. Chen comes previously to the polar semi-sign (Sun) of the Trigram Ch’ien in force, is therefore the oldest in the past time and Tui the youngest, thus leaving Chen up as the upper Trigram and Tui as the lower Trigram (Tui-Chen, H54). There exist several working instances where both Circles unite, but there is no known reason for creating whimsical and pre-established Hexagrams. Micro and Macrocosm are always overlapping in two invisible circles, where the internal, Micro, rotates in the direction of time and is conditioned by the energy and motions of the Macrocosm. That the Earlier Heaven Order and the Later Heaven Order coincide in perfect harmony always in the life of a human being is simply impossible; those who achieve it in a minimum percentage transcends, die physically and could perhaps break the deepest cycle of “Cause and Effect.” For this reason it is useless to work with the union between the two Heavens in a mechanistic way, it isn’t real. Much like Don Quixote and his monomania with knights and chivalry novels, my non-fiction “monomania” is with the Yijing (or “I Ching,” as popularized by the Wilhelm/Baynes translation and the Wade-Giles transliteration of Chinese). I read extensively on the subject and I know for a fact that I’ll never exhaust it in a lifetime. The thing is, for those reading and still stuck in the conceptual visualization of the Yijing as the exotic Oriental version of the Tarot and a hippie Ouija board, the classic is so much more than an usable oracle that the exegesis inspired by it, over thousands of years, is only second to the Bible (although, if I request a recount, it would most likely come up in first place). Unfortunately, most Western media, and users, focus only in the oracular usability of the classic and, because of it, it is often derided and belittled as quackery. Well, their loss, not mine. In the meantime, my so called “monomania,” takes me to the most varied reading paths. Hard to believe for most, I know. See, serious students of the Yijing can find many parallels between the inherent imagery of the classic and subjects that, at first sight, seem unrelated to it. One of the cornerstones of Chinese philosophy is “correlative thinking” and, although it runs against the grain of Western philosophy and its use of logics and analytics, its metaphorical toolbox is a spring of ideas and associations. Carl Jung, to name just one philosopher (yes, philosopher), realized the truth of its potentiality and applicability in Western thought. As the classic, and its exegesis, becomes more available to Western philosophers and writers, its use in metaphorical comparisons and the pursuit of meaning is slowly becoming commonplace. One such writer is the psychologist Stan Gooch. In the early 1970’s he published “Total Man, an evolutionary theory of personality” and, in part of it, he touches on the Yijing. The book has fourteen chapters divided within six parts. Part five, “The Rise to Tyranny of Western Consciousness,” includes Chapter 11, “The Momentary Universe,” which talks about the Yijing from a Jungian perspective. The foregoing is not in any sense offered as evidence of the value or validity of the Book of Changes. There is nothing to prevent one regarding it still as a very complex folly, as a tragic monument perhaps to the wasted energies of a considerable section of humanity over a considerable period. Of course, the disclaimer was perhaps needed as part of the natural Western defensiveness against all things outside “rationality and logic” and as a service to the those readers that would automatically take exception to such concepts. Such disclaimers are chicken soup for their sensitive souls, in my opinion. Finding comfortable shelter while confronted with incomprehensibility. The chapter is actually very good and goes on to explain some points of view on synchronicity. The social scientist, erroneously, as I believe, has adopted many of the practices of the physical scientist on the implicit, often explicit, assumption that psychology and sociology are sciences. I myself on the other hand, together with some other psychologists, consider the wholesale application of the methods of the physical sciences to the study of human behavior to be among the major disasters of our time. This does not mean, however, that I believe those methods have no place at all in behavioral studies–though I have no space here to outline my precise position. The point I do wish to make very briefly–a slightly different one–is this. Because of the fact that we ourselves are the objects of the psychologist’s and sociologist’s studies, we cannot grant the psychologist the same automatic authority that we grant the professional physicist or chemist. Rather, the position resembles that which pertains in democracies in respect of Parliament. The people elect representatives to govern them–individuals whom they consider particularly suited to do so–granting them by such election a mandate to run the affairs of the country as they think best. It is when a point is reached that government behaves in ways deeply unacceptable to the people that that mandate is withdrawn. So it must be, I think, with the social sciences. We in a sense grant, or have granted, a mandate. But we do not thereby lose our inalienable right as human beings–the objects of the psychologist’s study–to reject not merely his findings but, if necessary, even his methods. The book is out of print and hard to find, cheaply. A good read, nevertheless. I admit it, it is my fault. The haiku-like nature of Twitter lends itself to the dangers of open interpretation by others. Furthermore, the two-way nature of the medium, practically assures the immediate feedback of those waiting in the background with specialized nets that fish for specific words of their liking. It is like one of those Sushi restaurant with a carrousel, immense in size, where all kinds of fish pass in front of the patrons and, occasionally, their favorite fish appears and they take it front the carrousel. Then, they eat it, digest it for a couple of seconds, and, if bad, instead of blaming the fish or their own predisposition for properly digesting it, they blame everything else between the happy life of the fish at sea to their own teeth.
. She missed both, apparently. Before I explain a few things, let me quote the next two exchanges. First my reply–two twits in length–and then her follow-up. I will also use bold and underline here, which isn’t available in the medium. The rant, as she put it, isn’t bad but, pointing to it (it was written days before these exchanges) perpetuates the defensive posture that prompted it, and, in the process, misses my point, again. Now, I suppose, is time for some clarifying thoughts. Alas, my initial comment in Twitter wasn’t a criticism of MBTI or the Eneagrams as tools. I align myself with Jungian thought so I could hardly fault a “tool” that was inspired by him, albeit grossly trademarked by commercial interests. What’s happening with the whole MBTI environment reminds me of scavenging pharmaceutical companies taking patents on the active ingredients of ancient medicinal potions still in use in many Third World countries, which is akin to “ZYX Energy Co.” filling for a patent for fire and water…, and getting it granted. You get my drift. Shameful, in my opinion, and far from the intention of Jung when he published his “Psychological Types” in 1923. Proverbially, the man must be turning in his grave. The missing context I talk about comes from a conversation in another forum–which does not deserves any negative feedback from those outside of it and shall remain anonymous–in which participants were quick to test themselves, comment about it…, and comfortably fall in place in their newfound little niches, like pegs on a board, wearing a badge that, for them, should obviate any conversation of whom or what they are or where they come from in a conversation. Thus, my twit/comment, was for those few that follow me there that are also participants in said forum. None of them took the bait, but, alas, the words MBTI and Eneagram got caught in “Blue Selective Net” and the fisherman manning it, instead of allowing the small fish to swim away, got it from the net and threw it back to the last fisherman. As I implied in the original twit/post, and my follow up to the lady’s comment, the real usefulness of the named tests isn’t at the street/individual level but as corporate and counseling tools. To obtain one’s own MBTI label, just because it is freely available, does nothing to further one’s personal quest for self-knowledge. It provides nothing specific that would serve as a ladder rung to descend into the depths of your self–or to step out of it if you find that your nature isn’t of your liking–nor will it help you improve it. It will, though, provide you with branding label. Unfortunately, branding labels, much like those in cattle, are mainly used by third parties to place you in your proper place. Thus, labels, in my modest opinion, diminish the self, rather than helping it to improve, by taking your freedom of movement within a given environment out of the equation. Which is why corporations love MBTI testing their current and prospective employees. When you need to open a conversation on differences between people an assessment tool like the Myers Briggs is an excellent starting place and provides a common language for people to begin to have a new understanding. Having said that, I wonder if those popularizing and commercializing the MBTI tests–I’m talking about those who know enough to get in trouble and misstep in an in-depth discussion by lacking proper exegetical reading–are familiar with the modern works of Richard D. Grant Jr. and Chris Lofting. Furthermore, how many of those have even a clue that the real root of the so called MBTI test, which is a modern trademark, in good old Western fashion of legally appropriating ideas, is a few thousand years old and from a far away land? As for the statement “self-knowledge is emergent assessments+conversation+reflection+selfobservation+feedback,” yes, I agree, those are some of the steps, but, if it were only so simple to find your way within, we wouldn’t be having this conversation, would we? The title is an allusion to the dangers that lurk in throwing words to their own fate into the Blue. Alas, I’ve fallen into those yonder pits myself. Has anybody noticed how Palin is the one that talks for 20 minutes, get’s the crowd into a frenzy, and then passes the mic to McCain, he repeats his mantras like an obsessed for 5 minutes and then is over? The other day I commented that I thought that it was actually McCain the Trojan Horse for Palin (or Palin alikes) into the White House. If that is the “change” they propose, placing a Christian fundamentalist in the W.H. isn’t the kind that should be welcomed by anybody. Yes, the whole thing is “mavericking” (*) their way into the W.H.